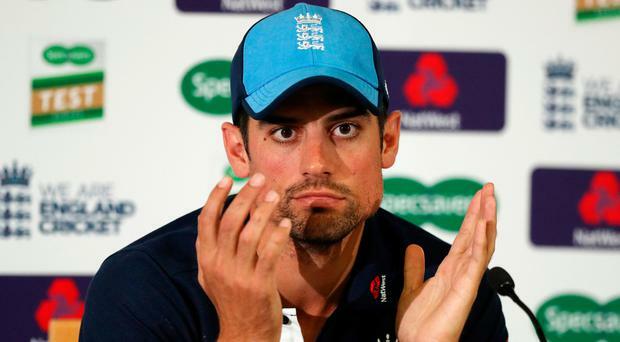 Alastair Cook had little bother controlling emotions at his farewell press conference, but it was a tearful tale when he first broke it to England team-mates that The Oval Test will be his last. Only a timely quip from all-rounder Moeen Ali, and a few beers, stopped him welling up in the dressing room after Sunday's series-sealing victory over India in Southampton. As England bid for a 4-1 scoreline in their all-time record runscorer's 161st Test, Cook hopes for a send-off in keeping with his prolific career rather than the meagre returns of late which persuaded him to call time. It's been three days since he told the world of his international retirement, but equally fresh in his mind is the moment he needed to address his team-mates on the same matter. "I was a couple of beers in -which I needed to be - otherwise I would have cried more than I did," said the 33-year-old opener. "I managed to hold it together. I just said, 'This might be good news for some and sad for others, but it's time - I've done my bit, and if picked the next game will be my last one'. "There was a bit of silence, Mo said something, we all laughed - and everyone got on with it." Cook, who will play on for Essex after signing a new three-year deal with his lifelong county, is able to cite his brilliant 2010-11 Ashes campaign and first as permanent captain in India six years ago as highlights of his Test career. There have been vexed times too, though, and he reflects on the circumstances which made summer 2014 his lowest point - after the axing of England's mercurial run-getter Kevin Pietersen. "The KP affair was a tough year," said Cook. "The fall-out of that for 12 months wasn't great for English cricket, and wasn't great for me. It could have been handled differently." Cook's retirement has been depicted by many as the end of an era, after which few will aspire to bat as he has with the out-and-out patience of a true Test opener. He said: "I'm not sure I'm the last of a dying breed, but naturally kids are going to be attracted by the razzmatazz of Twenty20 cricket. We have to embrace it." Surrey wicketkeeper Ben Foakes is in line to make his white-ball debut for England after a dislocated shoulder felled Kent’s Sam Billings. Chris Jordan admits a place in England’s World Cup squad was not even on his radar a few weeks ago but is ready to take his unexpected chance with a smile on his face. By Ian Callender It's a clash between the Long's SuperValu Premiership favourites and last year's surprise champions to start the new season in the North West tomorrow with Brigade having the most to prove as they bid to end an eight-year wait to bring the league trophy back to Beechgrove. By Ian Callender A repeat of last year's Challenge Cup final is the stand-out match on the opening day of the new Robinson Services Premier League season tomorrow, but this time Civil Service North have high expectations of a different result.